Indigenous Peoples and other communities hold and manage 50 to 65 percent of the world’s land, yet governments recognize only 10 percent as legally belonging to these groups, with another 8 percent designated by governments for communities. WRI’s new report, Climate Benefits, Tenure Costs: The Economic Case for Securing Indigenous Land Rights in the Amazon, examines the value of lands legally held by Indigenous Peoples in Colombia, Brazil and Bolivia. We found that these “tenure-secure” indigenous lands generates billions and sometimes trillions of dollars’ worth of benefits in the form of carbon sequestration, reduced pollution, clean water and more. 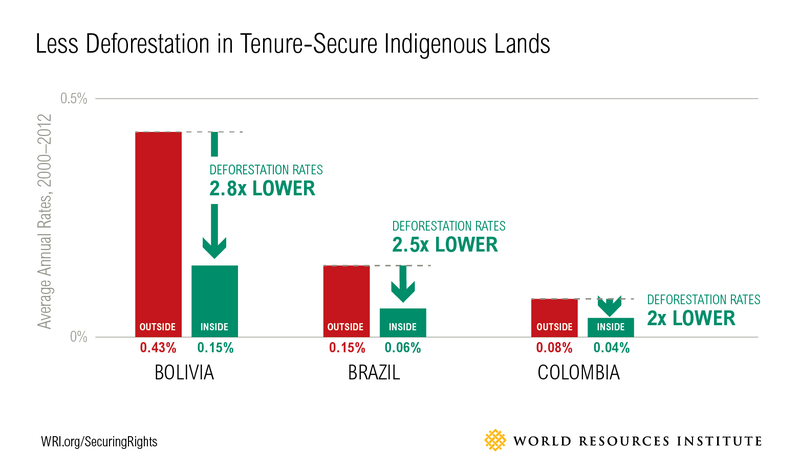 For the period 2000 to 2012, the average annual deforestation rates inside tenure-secure indigenous lands were 2-3 times lower than in similar forests without secure tenure in Bolivia, Brazil and Colombia. The three countries have undertaken a regularization and titling process to recognize and protect indigenous lands since the 1990s and, in particular, in the past decade. The effects on reducing deforestation are already observable, suggesting that deforestation rates have declined over time and that these effects will likely continue if the indigenous lands remain secure. Tenure-secure indigenous lands in the Amazon store carbon, reduce pollution by filtering water, control erosion and flooding by anchoring soil, and provide a suite of other local, regional and global “ecosystem services.” These benefits far outweigh the costs of securing land tenure. Tenure-secure indigenous lands in the Amazon can generate a net total benefit ranging between $4,888 and $10,784 hectare in Bolivia, $4,636 and $10,402 per hectare in Brazil, and $4,610 and $10,344 per hectare in Colombia. This translates into estimated total economic benefits for a 20-year period of $54–119 billion for Bolivia, $523–1,165 billion for Brazil and $123–277 billion for Colombia. 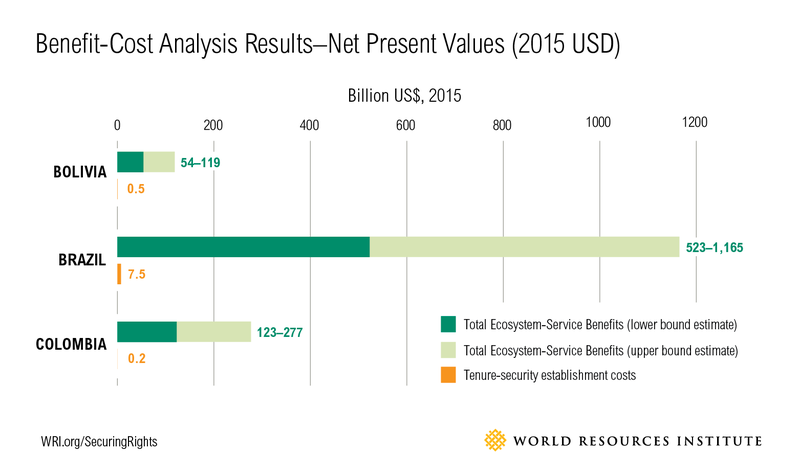 The total costs of securing these indigenous lands for 20 years are at most 1 percent of the total benefits derived. 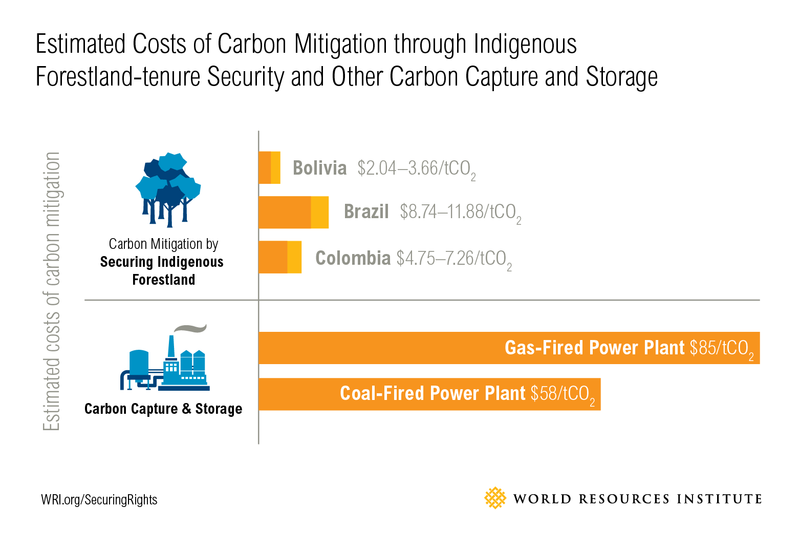 The estimated costs of carbon mitigation through securing indigenous land in Bolivia, Brazil and Colombia range from $2.04 to $11.88 per tonne of carbon dioxide (tCO2). These costs are significantly lower than the average costs of avoided CO2 through carbon capture and storage of fossil fuels, which are estimated to be about $58/tCO2 for coal-fired power plants (5 to 29 times more expensive than securing indigenous lands), and $85/tCO2 for natural gas-fired power plants (7 to 42 times more expensive). Secure Indigenous and Community Lands. Governments and their partners should reform their laws to provide Indigenous Peoples and communities with sufficient legal protections, and take other necessary actions to strengthen land rights, including mapping, demarcating and formally registering this land. Make Tenure-Secure Indigenous and Community Lands a Central Climate Change Mitigation Strategy. 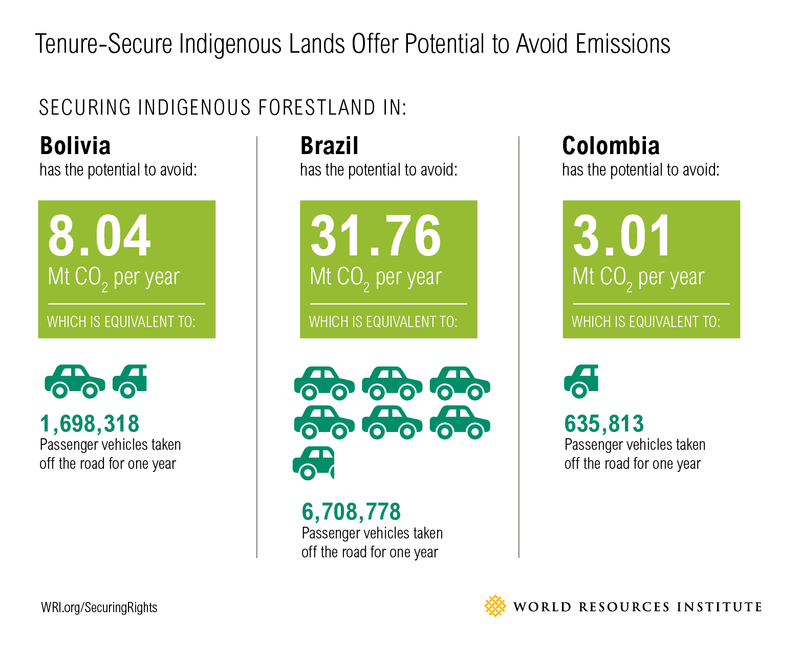 Had indigenous lands not been secure in the Amazon, CO2 emissions would have been higher—about 9 percent more per year in Bolivia, and 3 percent more per year in Brazil and Colombia. Investing in securing indigenous lands is a relatively inexpensive action that governments can take to help meet emissions-reduction objectives, such as the Nationally Determined Contributions (NDCs) submitted as part of the Paris Agreement on climate change. Utilize International Development Funds to Secure Indigenous and Community Lands. Governments and their development partners should increasingly direct their resources to securing indigenous and community lands. The funds could support government agencies in formally documenting and protecting indigenous and community lands, as well as the Indigenous Peoples and communities who invest in protecting their lands. For more information and to download the full research report and the report summary in English, Spanish, Portuguese or French, go to: /our-work/project/securing-rights.